Some of you younger chiropractors may wonder how a practice could have been run successfully without all of today’s modern technology. It can be done! I've been in practice and I actually had to build a successful practice without e-mail, a cell phone, an iPad or a web page back at the beginning. The world has changed, and technology has made the process of running a business so much easier and has expanded the possibility to grow a massive practice. Unfortunately, many practices are still not utilizing that modern technology. Even if you are already using some technology, there are new advances coming out regularly that will make your practice run more smoothly and profitably. The special guest on this podcast is the co-founder of ZingIt Solutions, Steve Weber. Zingit Solutions’ mission is to provide a communication solution that will guide small businesses through an ever evolving technological world, with the personal touch of a small business, yet the appropriate amount of technology as to not disrupt the personal experience. The tremendous amount of information you’ll receive on this podcast will help you impact your community more effectively and develop greater connection and engagement with your practice members. 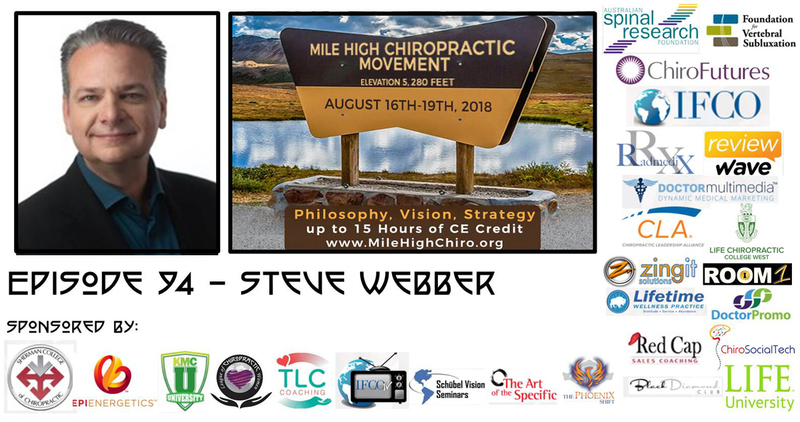 You can hear nearly 30 great speakers like Steve at Mile High 2018 in Denver, August 16th – 19th. If you haven’t registered yourself and your team yet, do it now at www.milehighchiroregistration.com before the investment increases again on July 15th! Looking forward to seeing you and your team a Mile High! How to easily reschedule missed appointments, send reminders for future appointments, reactivate patients, send mobile video birthday cards and so much more.